If a Chipotle chile is a can-can dancer—all showy, high kicks, look at me pleeeeze – then Ancho is the quiet man sitting in the corner, nursing a glass of absinthe and smoking a gauloise. You may not notice him at first but trust me, he’s worth a second look. While Chipotle has in-your-face smokiness and Habanero has enough heat to knock your socks off, Ancho has something altogether more subtle but equally appealing. Let’s start with the basics. Ancho means ‘wide’ and the Ancho starts broad at the top then gently tapers to the bottom—kind of a heart shape. Fresh it’s called Poblano (it’s the chile used in dishes such as chile rellenos). Once a Poblano is dried, it gets the name change and has a deeper dark red – almost black – color and a mild, fruity flavor. How mild? Okay, let’s talk Scoville. Scoville is a method of measuring chile heat. Developed by a man named Wilbur Scoville back in 1912, it originally used human tasters to measure the heat in a chile (imagine that job). Now we have a high-tech method called High Performance Liquid Chromatography that precisely measures the amount of capsaicin in chile. Capsaicin is what gives chile heat. Ancho measures about 1,000-1,500 on the Scoville scale. To give you an idea of what that means, a Jalapeno is around 2,500-5,000 and a Scotch bonnet or Habanero is 100,000–350,000+. What else to do with Ancho? The dried pods can be toasted on a dry frying pan, rehydrated with hot water and made into an awesome chile paste that gives a bit of heat—but not too much—and a lovely, warm reddish hue to a dish. 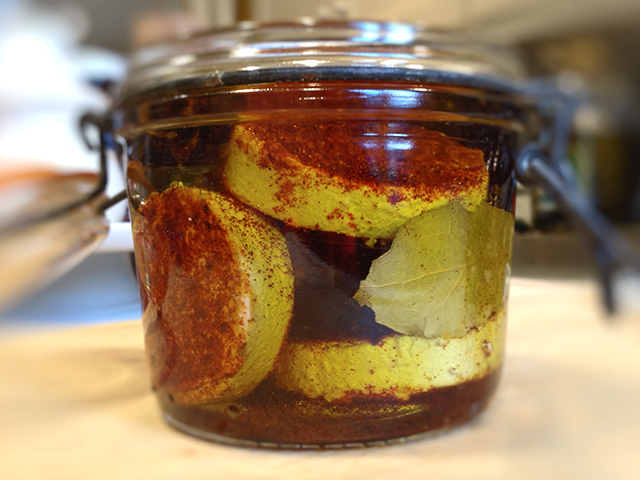 Or if you’re feeling a bit Martha, make a jar of our (soon to be) famous Ancho Chile Goat’s Cheese. And as ever, if you’ve got a recipe with Ancho—or any other chile—send it our way. We’d love to give it pride of place on The Chile Trail. 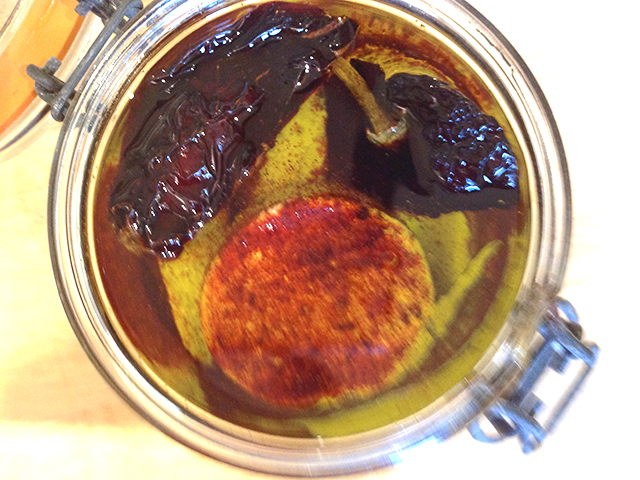 Goat’s cheese + olive oil + ancho chile. It’s quick, it’s simple and boy does it taste good. The key is to let the goat’s cheese marinade in the oil for a day or two so the flavors really develop. But let’s face it – life is short so please feel free to eat immediately. Slather it on a crusty baguette, crumble it onto roasted veg or place a disc on a grilled chicken breast. Take a small, scrupulously clean jar (a 1 pint capacity Kilner or Le Parfait jar is a great choice and looks nice too). Fill it ¾ of the way with olive oil. Place the ancho chile powder on a small plate. Place a disc of goat’s cheese in the ancho chile so it’s lightly coated with chile powder. Flip and repeat on the other side. Gently, place the disc into the jar filled with olive oil. Repeat with the remaining discs. Place the two chile pods and the bay leaf in the jar and top up with olive oil, if needed, so all the ingredients are covered in oil. Close and place in the refrigerator until ready to use. This entry was posted in Chile Portraits and tagged ancho, capsaicin, chile, goat cheese, New Mexico, poblano by loschileros. Bookmark the permalink.